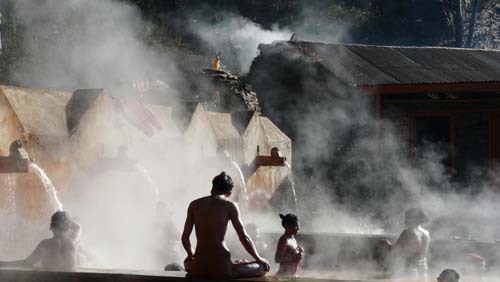 Closer to Kathmandu are a number of more accessible hot springs. On the road to Tibet (northeast of Kathmandu) lies Kodari which is the last village before crossing the bridge to China. Note that the persons opposite are nearly 3 hours ahead of the Nepali, forcing them to get up and get to work in the pitch dark. Anyway Kodari is basically a 2 km long village with houses and buildings along the road and squeezed between the road and the river. The hot springs themselves are far from a delite. More like a hot shower in a damp and dark room. Then again, they are easily accessible and during the winter Nepali flock here to take the waters. No personal accounts on i-net. Just the following photo. The hot springs of Kodari. Source. Closeby is the Last Resort, an action laden resort for the not so faint-hearted. But a great place to stay. 'The signposted hot springs are at the northern end of the village, down steps towards the river. A hot tub it's not: the water splashes out of pipes into a concrete pool and is used strictly for washing'. Directly north of Kathmandu up and along the Trisuli river lies the district of Rasuwa and towns such as Dhunche and Syabrubesi, gateways to the Langtang national park and Gosaikunda, a holy mountain lake. 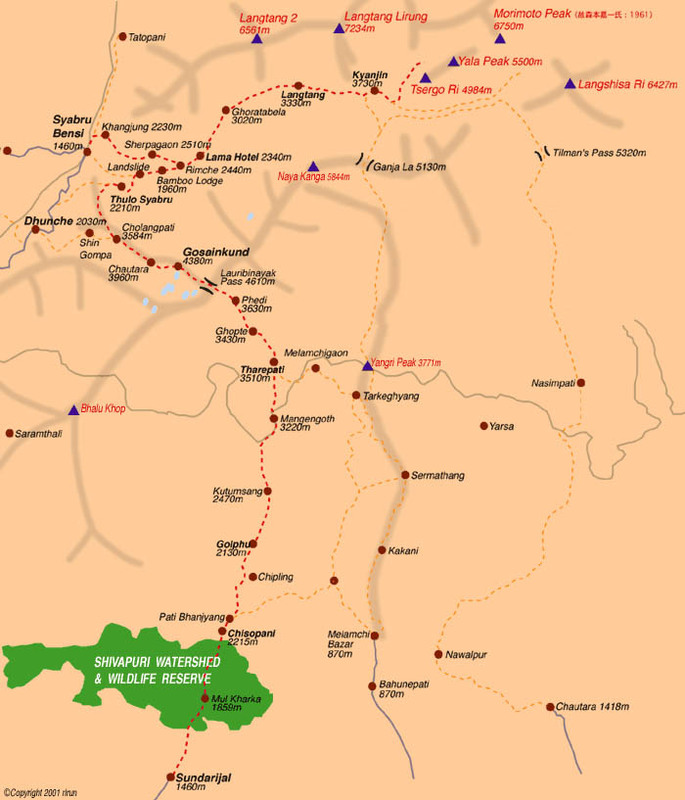 Lately treks (Tamang Heritage Trail) are also heading westwards and are incorporating a hot spring Chilime, though it's also referred to as Tatopani (hot water). Possibly the biggest in Nepal? I visited there back in 2001, it's a full days walk up the mountain side. From current pictures I deduce that at least the springs themselves have not changed. is what Franziskadoswald adds. Do note that Nepali style bathing suits are pretty much non-existent, so much for the advice. Back then there were no guesthouses, just a couple of huts to overnight in and hardly any other facilities. That seems to have changed, luckily. It was (and probably still is) quite out of the way and attracts mostly Nepali soakers. 'Early morning, at the height of 2500 meters, in december, it is cool but hot springs are very hot. The next trekking trip at Tatopani, with yoga and hot bath will be in March 2009'. Eric Lon and Chilime hot spring. Note the (un)dress code. Elsewhere Syabrubesi (Wikipedia contends it's Syafru-besi) one of the main towns in the area has it's own hot spring, nearby the river. 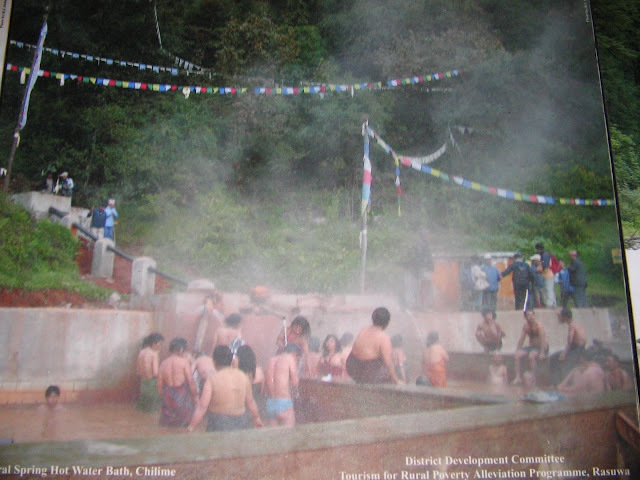 More scientific info has been published on this hot spring. 'a small hot spring on the opposite river bank at 1810 meter'. Then there is most probably a hot spring half a days walk north of Syabrubesi into the restricted area of Rasuwagadi. Unfortunately my only proof of this is a map with a Tatopani due north. Possibly it could well be the hot spring of Syabrubesi itself.